Microsoft has adopted technology from IO Industries to raise Virtual Reality production to new heights of realism and flexibility. The technology of video production, especially as it relates to VR (Virtual Reality) and AR (Augmented Reality), is about to take a giant leap forward. 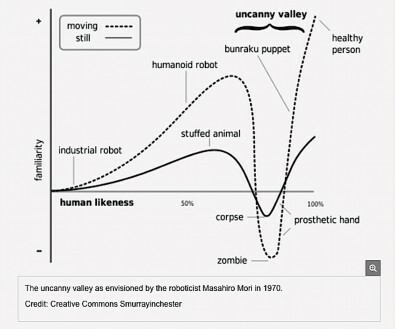 In fact, it’s about to jump a valley—the famous uncanny valley. The abyss of the uncanny valley. BTW, “bunraku” refers to large Japanese puppets manipulated by actors (click to expand). As this graph shows, crafting an imitation of life-like humans can be entertaining, up to a point. But if you come too close, and there is still something unidentifiable missing, it becomes creepy. That’s why, up to now, most motion capture approaches, no matter how pseudo god-like, have been better at creating Gollum than Swan Lake. But the world of VR is changing. IO Industries’ use of multiple high speed cameras and capture systems had been successful in scientific and research applications such as fluid dynamics, aerospace airfoils, and weapons testing. But when I asked Searle if what IO Industries and Microsoft were working on could be referenced to the famous “bullet time” or “time slice” shot from 1999’s “The Matrix”, he acknowledged the similarities but used the differences as definitional. This lets the director move the viewpoint of the audience as the action demands, while maintaining the illusion of 3D depth. Another useful reference is today’s motion capture techniques, where multiple angles from cameras looking at actors often wearing special suits are combined inside a computer to create a skeletal model of the person onto which a c. g. character can be modeled. As we have seen in many brilliant motion capture films this can look highly realistic for fantasy characters—but never quite real enough to represent actual humans. You can even interact with VR images created b Volumetric Capture on a 2D screen. “Since Microsoft’s Volumetric Capture is recording the entire actor from all angles, all the muscles, all the facial expressions, all the soft tissue movements, we can cross that realism gap,” Searle told me. IO Industries' DVR Express raw recorders offer LTC timestamp, frame triggering and configurable SSD storage. The system employs one additional rather clever trick. Only half of the cameras are outputting RAW, RGB color video. The other half are recording near-infrared images of the tiny dots projected onto the actors’, props’ and objects’ forms by several laser pattern projectors mounted all around the set. 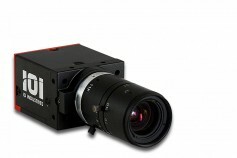 Victorem camera uses advanced global shutter CMOS sensors with high dynamic range. Searle wanted to be clear during our interview that the Volumetric Capture is the result of almost 7 years research invested by the Microsoft Research Division, but about two years ago they came to IO Industries for some key empowering technologies. Most importantly, since a common configuration of a Volumetric Capture utilizes up to 100+ cameras for each take, fully shutter-synchronized with microsecond-level accuracy and recording unprocessed RAW images, they generate over 10 Gigabytes of data per second. Then to wrangle all that data, IO Industries StudioCap management software merges these files so they can be fed into Microsoft’s own processing engine from which it is output as real time, moving 360-degree imagery. StudioCap management software gives you live video streaming with focus assist and production database integration. Microsoft is not the only tech firm going after this Volumetric Capture concept for future production, but they are definitely on the forefront. And making great progress in both VR and AR production using it. “We’re going to be on the other side of the uncanny valley any time soon,” Searle concluded. In August, a new studio called Metastage providing Volumetric Capture capabilities based on the Microsoft approach to VR and AR was opened at Culver Studios in Culver City, California. This joins Microsoft’s own Mixed Reality Capture Studios in San Francisco and Redmond, Washington. The system has also been licensed to London’s Dimension Studios in the UK.